Published on Friday, March 10, 2017. This article appears in the February/March 2017 issue of American Craft Magazine. Brooks built his home in 1970. 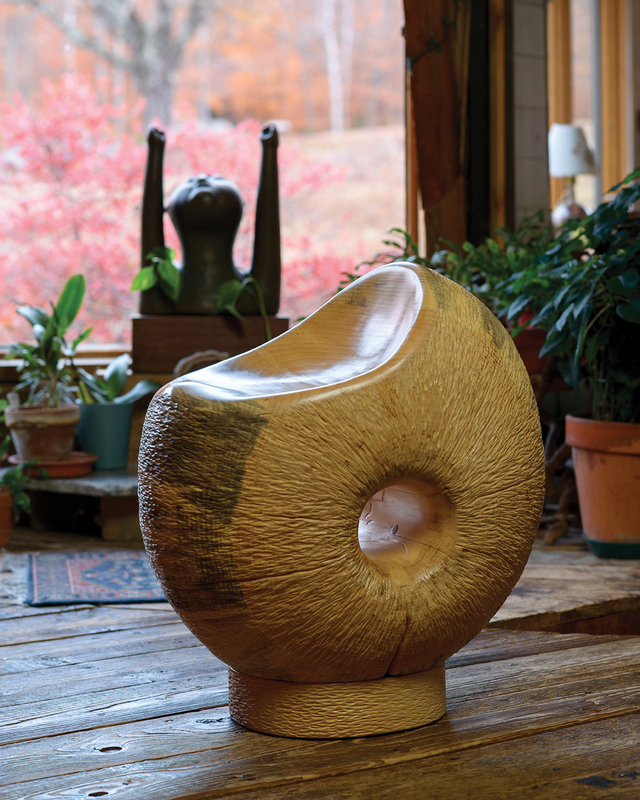 The endomorphic structure sits among wood and stone sculptures he created a few years later. Tri-Stair exalts a potted plant. He and his wife, Jami Boyle, sleep at the top of the home’s turret. 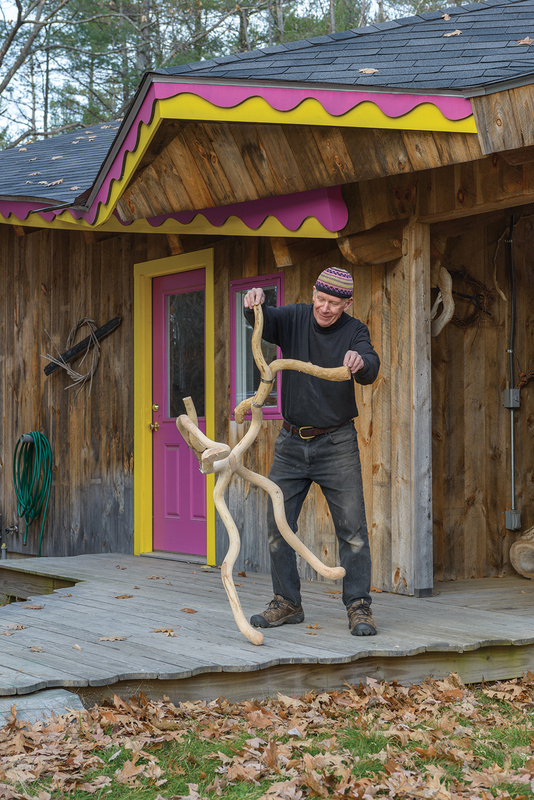 Furniture maker Jon Brooks works in a fairy-tale setting, a huge swath of conservation land in the woods of southern New Hampshire. 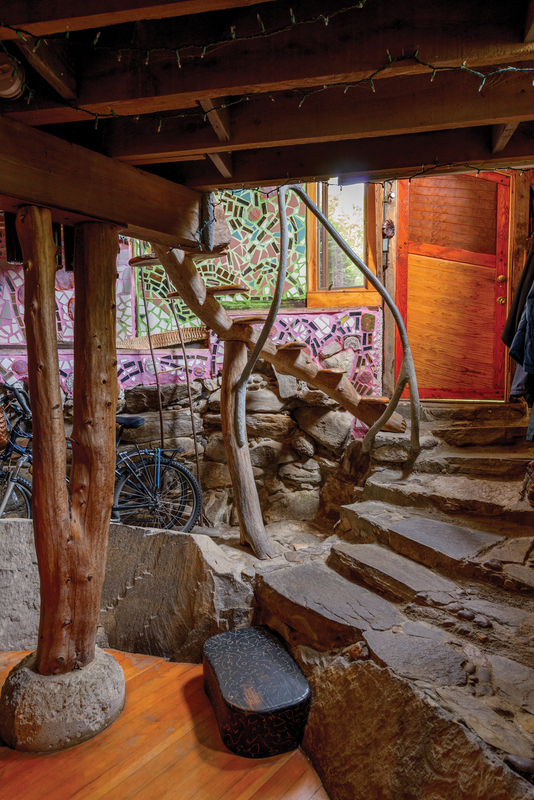 At its center is the house that he built in 1970 with his then-wife, the artist Mona Adisa Brooks. It looks like it’s from an upscale version of Hansel and Gretel; the grounds include vegetable and flower gardens, a chicken coop, and sculptures. 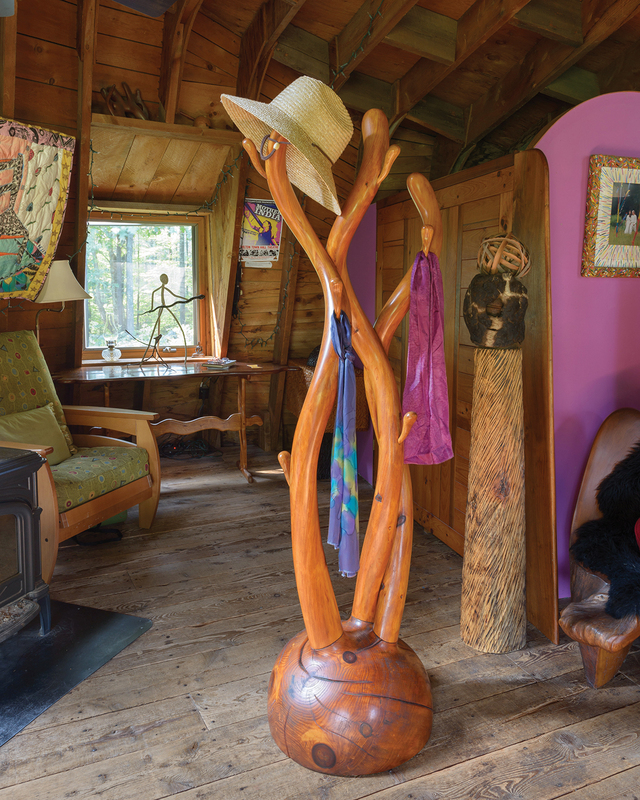 He built his first studio in the same style as his house; after a devastating fire a few years ago, he, wife Jami Boyle, and friends rebuilt the multi-structure complex in a more muted style, but the whimsical touches remain. I was 5 or 6. It was because of a problem with a teacher who wanted me to color inside the lines. Her response to my protest with a wad of crayons landed me in an art program at the Currier Museum of Art, near where I grew up in Manchester, New Hampshire, and where I had a retrospective more than 60 years later. What kind of influence did college have? I was accepted at Rhode Island School of Design and Rochester Institute of Technology. I chose Rochester because it was farther away from home. I was interested in sculpture rather than furniture at first, but that changed after I became Wendell Castle’s first apprentice. He was a mentor, and that stays with you through your life. Wendell wrote the introduction to the catalogue for my 2011 retrospective at the Currier. You’ve always made sculptural furniture, but your work has changed over the years. Tell us about your early work. My early pieces were often made of a single piece of wood. I love [Constantin] Brancusi’s and [Isamu] Noguchi’s work, and I tried to find wood with sculptural lines that could still be used functionally, although not all my furniture is intended to be functional. Sometimes I combined several large pieces, maybe of different woods. When I was at RIT, I had to get it from salvage in upstate New York. But once we bought this property and built a house, I was able to use wood from the 200 acres of conservation land around us. I made a 3-mile trail system, and wood regenerates very quickly in New Hampshire, so I don’t have any problem sustainably harvesting the wood I need. I look for curved shapes and strong lines. I mark trees and harvest a bunch of wood at one time. I strip the bark and store the wood, much of it curly sticks for my current work. Wherever I am, I use only indigenous woods. Exotic woods are not in my repertoire. There was a significant turning point in your work. Tell us about that. It started when a Tasmanian artist I had met in the US recruited me for an artist-in-residence position in 1983 – ’84 at the University of Tasmania. At first I continued with my previous work, but I soon decided that since I was in a new place, with new materials available, I should try something different. 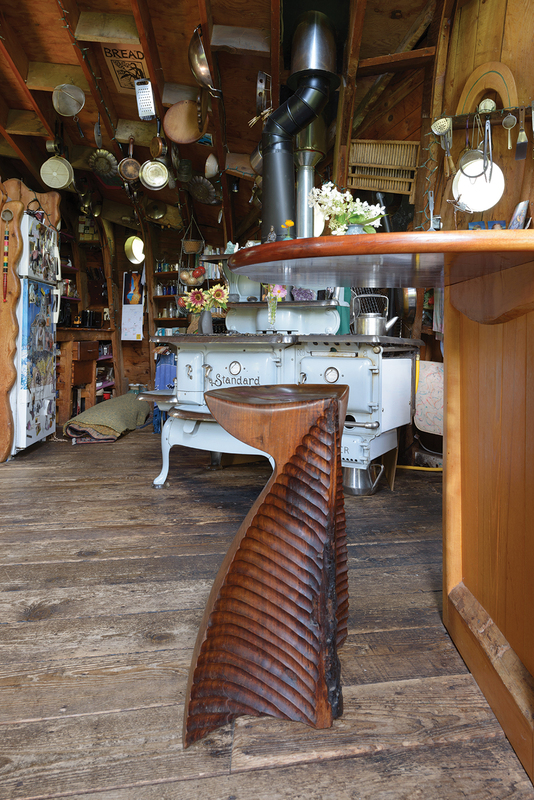 Tasmania has huge forests with indigenous woods like Huon pine, which is wonderful for furniture. I loved Aboriginal art, which uses a lot of color, so color increasingly entered my work. I began to make work, some of it non-functional, assembled from multiple pieces, some smaller sculptures. By the time I returned home, my work had changed totally. How was the new work received back home? Galleries loved it. Clients accustomed to my previous pieces weren’t so enthusiastic, and since I didn’t want to continue in that style, there were no commissions for a while. But gradually the commissions came back. In some periods I’ve had two to three years’ worth of commissions. Some of my work is on spec and some on commission. The price is based, in part, on time. For years Jami nudged me to keep track of my time, and I finally started to. But now I just know instinctively how much to charge. This chair I’m working on now, with nine legs, will take hundreds of hours and sell for $20,000. Tell us about your house. 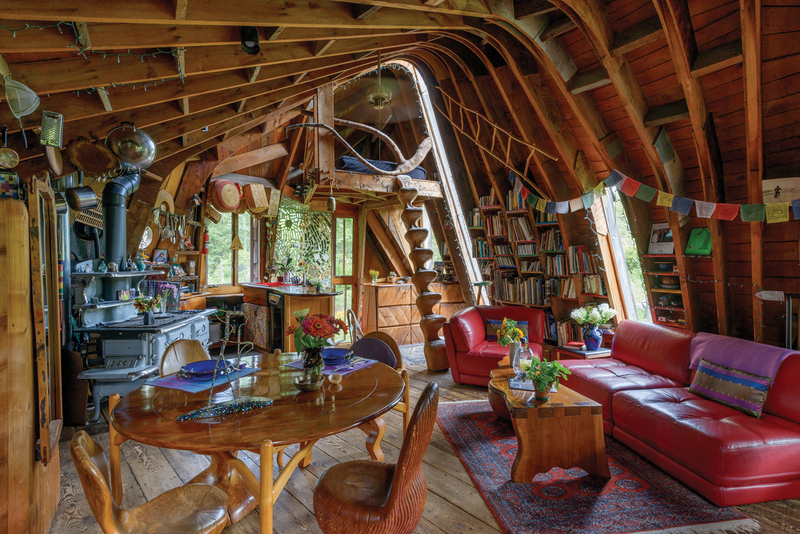 I had no formal training in architecture, but fine art was a great foundation, and, as a child, I had always built things like treehouses in the woods. Initially the house was supposed to be a simple A-frame, but the ceiling turned out to be too low at the edges, so we just lowered the frame to be the floor. We were then free to adopt a more unusual design. I didn’t want to live in a box, so the only straight line is the floor. We did everything ourselves; fortunately, the local building code wasn’t enacted until the year after we started the house. The house is actually overbuilt. It was an experiment, but it’s lasted since 1970. Good, right? Do you have much of your own work in the house? 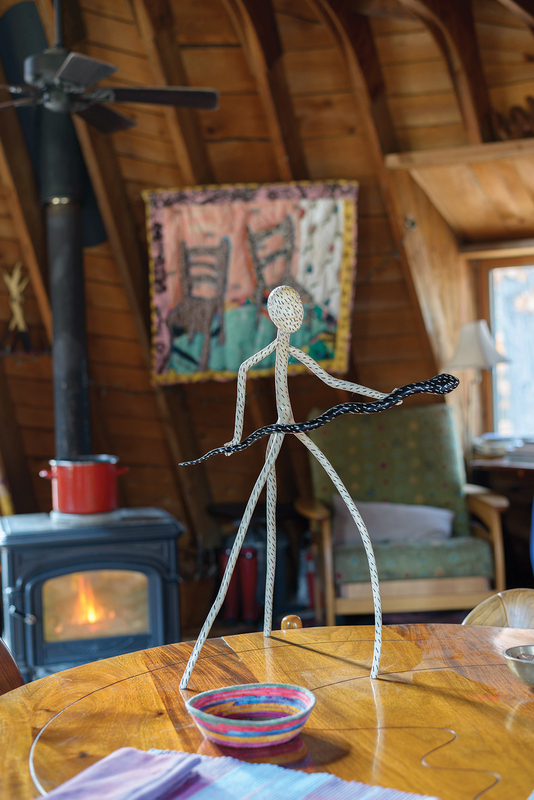 The house contains both early work – like a very big chair from a single piece of wood, like the tall non-functional ladders made of curly sticks – and recent work, like the small painted sculptures made of bronze, after Garry Knox Bennett and Judy [Kensley] McKie put me onto a foundry in California. Besides your own work, what else do you have in the house? Among my favorites are a plaster sculpture by Wendell Castle, a stool by Stephen Hogbin, mosaic tile work by Isaiah Zagar on interior walls and the exterior chimney, wall sculpture by Randy Shull, and other work by Howard Werner, Deborah Felix, and Gerry Williams, and ceramics by Edwin and Mary Scheier. All the works were traded for, with the exception of ceramics that were collected by my parents. You lost a lot of work in a fire a few years ago. What happened? I had a studio that we built in 1972 and added to over the years, with a bench room, machine room, and storage place. In December 2010, heavy snow caused a main electric wire to pull off the front of the studio and start a fire. Jami woke up and called the local volunteer fire department, but it took them half an hour to get here. She directed them while I was off ranting in the field, but they couldn’t do much, and we lost four buildings. All the pieces I had finished or in process, more than 20 of them, were destroyed. It was devastating. It was hard, but the global community, including CERF+, really helped. It donated money, tools, and support and said my work must go on. Martin Puryear even gave me a special type of vise to replace mine, which had burned. By January we had plans for a new structure, which was prebuilt elsewhere by my older brother, a post-and-beam builder, and moved here. I got back to work, but I had to do something reflective of the fire, so I made some works from pieces charred by the fire, and I’ve used a torch on a few pieces since then. You also had an exhibition to prepare for. Yes, a retrospective of my work, called “A Collaboration with Nature,” which opened in March 2011, with works from private collectors and museums. It was very gratifying, because my work was initially not well received in New Hampshire. The League of New Hampshire Craftsmen once asked me to bring them work, and after a while they called and asked me to take it back! But that has long since changed, and the Currier show brought me from an emotional bottom after the fire to the top. Snake Man, Fear and Temptation (1990) is Brooks’ response to the abundance of poisonous snakes in Tasmania. A Hearthstone stove heats the house; Brooks and Boyle collect wood to keep it burning. 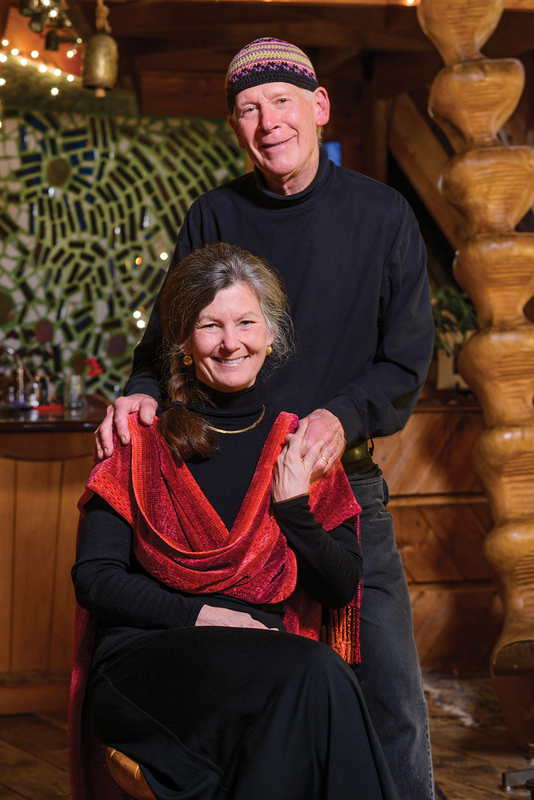 Brooks and his wife, Jami Boyle, an ordained minister and interfaith spiritual director. A stool by Canadian artist and friend Stephen Hogbin, traded for when both men were residents at Artpark in western New York. Brooks connected spiral forms to create his coat rack. Behind it stands Fire Buddha (2010), which he made with a piece of stovepipe he found in the charred remains of his studio fire. Brooks likes to unwind after a busy day in the studio by cooking on his 19th-century range. He carved the 10-foot staircase leading to the sleeping loft at the back of the room from a single piece of elm; chisel marks serve as treads. Brooks named Torus (2015) after the doughnut-like geometric form it’s based on. 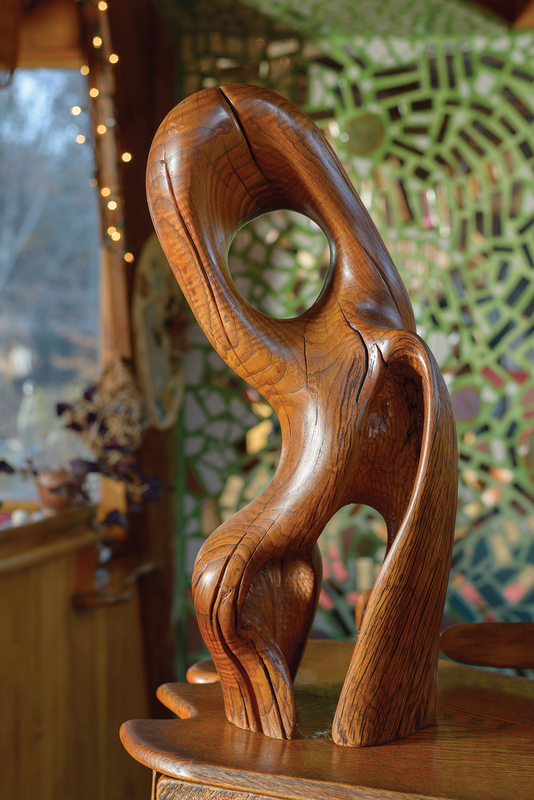 The textured pine chair was carved from a single piece of wood. His mentor Wendell Castle made this plaster sculpture in the 1960s and gave it to Brooks. 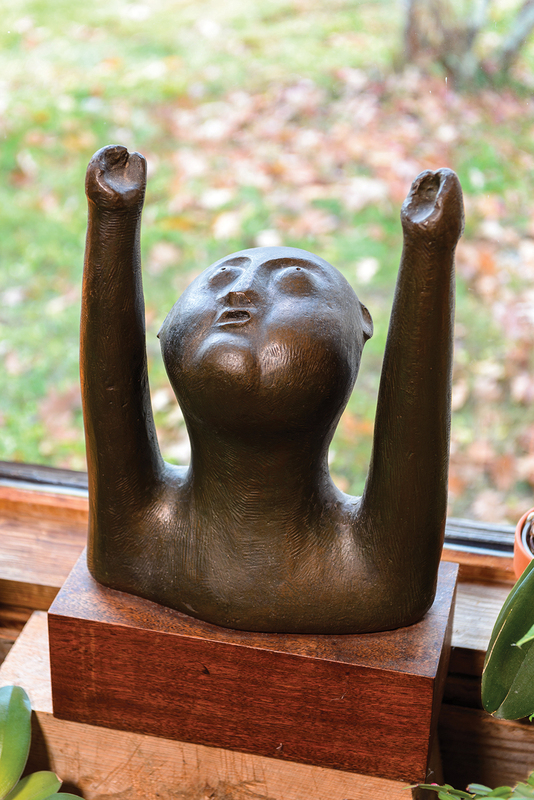 Brooks made this chestnut sculpture to commemorate the 1972 birth of his daughter, Rebekah, now a jeweler. Brooks likes to trade work with other makers. Mosaic murals by Isaiah Zagar add color to the front entry. 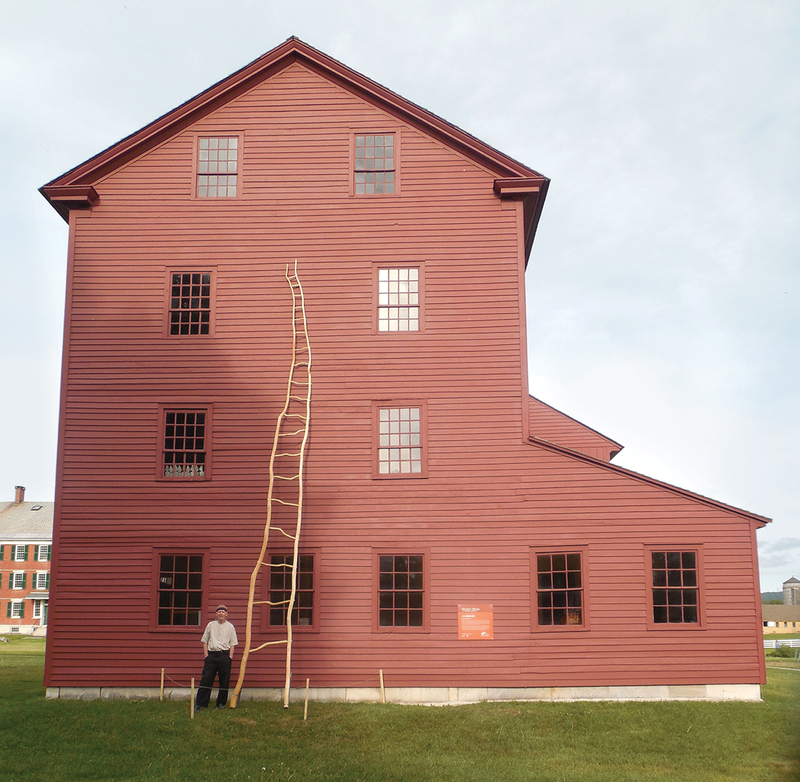 The artist beside his 27-foot Shaker-inspired ladder (2015) commissioned by the historic Hancock Shaker Village in Massachusetts. Brooks cavorts with a piece in the early stages, pondering next steps. “I do what I have to to get them to make sense to me,” he says. 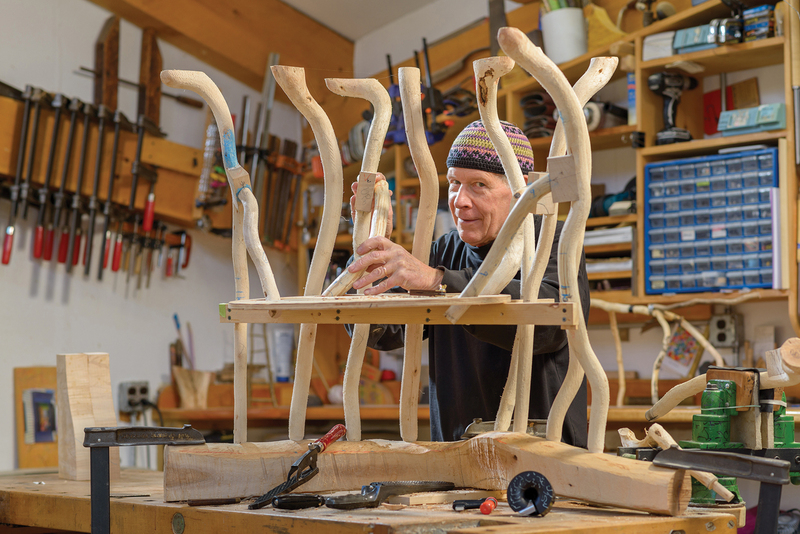 Brooks fits stretchers to the many legs of a chair. The work is the third in a series of wiggly furniture pieces that look like they might creep away. 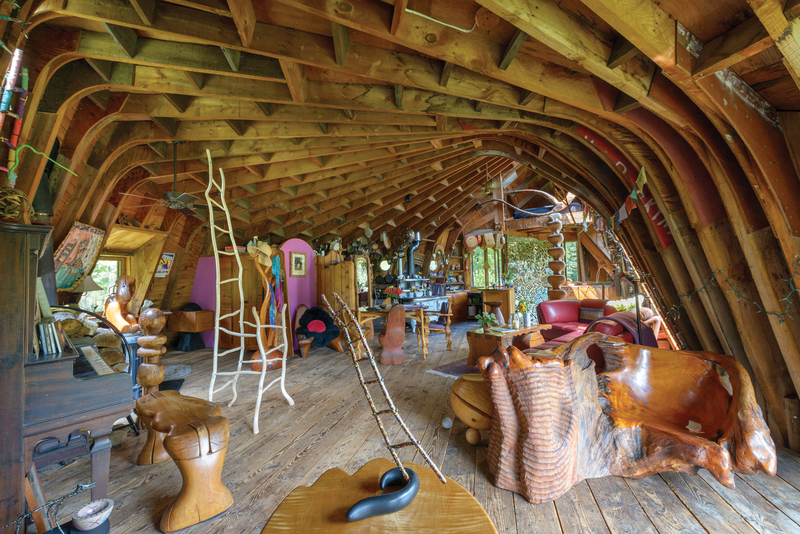 The main living space of Brooks’ home is alive with his work. Throne (bottom right, 1970) provides a cozy pine seat for reading, while the seatless Ghost Chair sculpture (center, 2014) only appears functional. 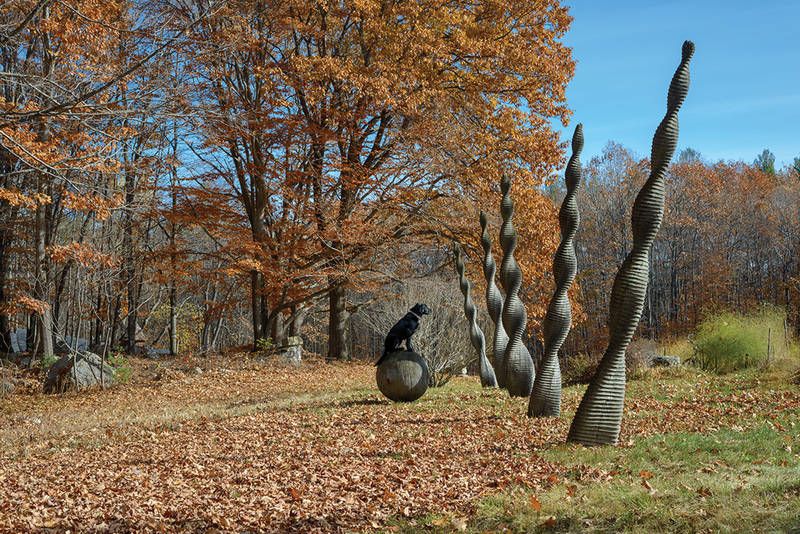 Seated on top of Sphere, Maggie gazes at Brooks’ Spiral Pillars. Made in the 1970s, the works are pressure-treated wood so they can withstand the elements. 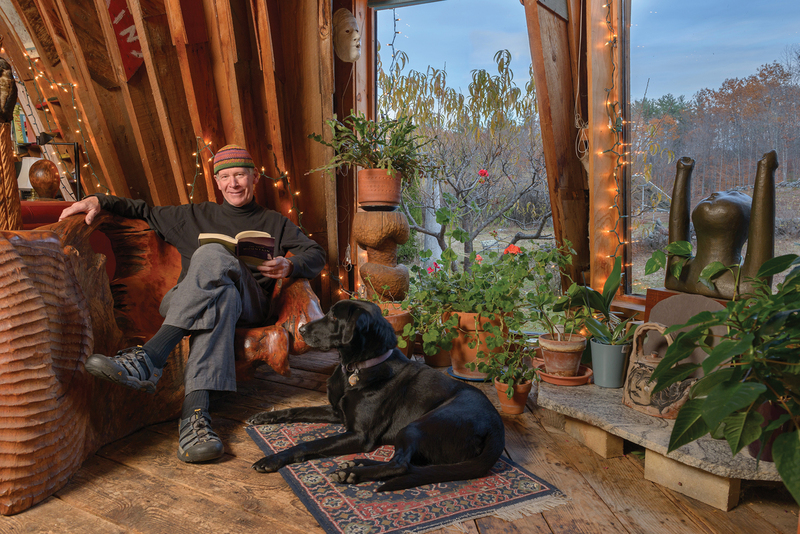 New Hampshire artist Jon Brooks hangs out in a nook of his house with friend Maggie.